Recommendations to Modify the 13th Floor Proposal. West Delray Updates recommends changes. Click Here. Prepared Jan 2018. NOTE: The modifications are made without viewing the actual building design and building footprints. 13th Floor has not yet released that information. Expect updates when released. 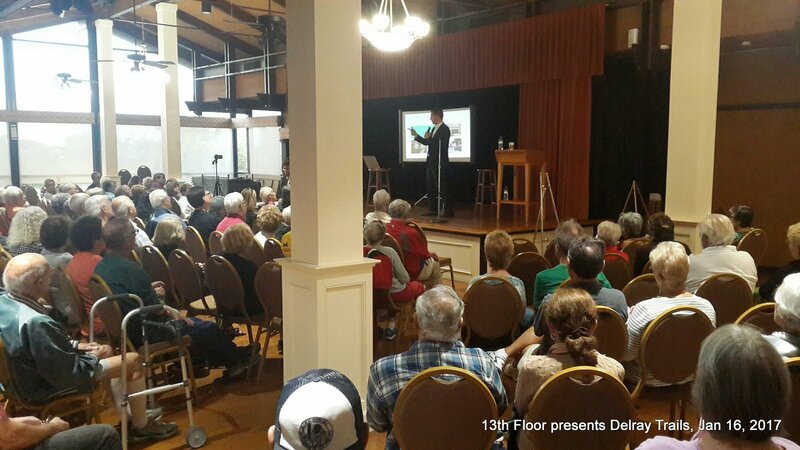 This week January 16-19, 13th Floor Homes will present its first proposal for the redevelopment of the golf course. All Palm Greens owners should attend one of the 8 meetings at the Clubhouse on Via Delray this week. The owner of the golf course is the Vitale Family. Peter Vitale has owned many golf course in south Florida. His son, Steven Vitale in Stuart, Florida, is the legal contact for the Villa Del Rey Golf Course, LCC. Via Delray and Via Flora are public roads and could be used by developers to access to future housing. All other roads and court access are private roads owned by the condos, including Via Aurora and Palm Greens Way. The Vitale family has permanent closed the golf course and restaurant in Sept 2016. All watering has been ended and the course is brown. The driving range is still open and golf lessons are available. By County code, the Vitales are only required to mow the first 25 feet along the roads and property line. The Palm Beach Golf Course was removed the market in October 2015, but as May 2016, the project with Lennar Homes has been terminated. Typically, buyers will pay for the property, if and only if, the buyers achieve the permission of the County Commissioners to build homes, condos or apartments on the golf course. Lennar Homes must have found some problems and withdrew. In February 2016, the presidents of Palm Green 1 and 2 have met with the Wantman Group Inc (WGI) and report that Lennar Homes is the developer seeking to build in the golf course. The boards have been meeting to determine a strategy. Palm Beach County planning staff reported that the Wantman Group Inc (WGI) in West Palm Beach has asked more questions to the County staff regarding the redevelopment of the Golf Course. Over the holidays, the potential developers or owners sent engineers to the golf course to drill multiple soil samples up to as much as 20 feet deep. Such drilling is typical to discover the “strength” of the soil for building foundations, the depth of watertable and soil pollutants. Other engineers were seen surveying Via Flora. Via Flora is the road that developers would use for access to any new housing in Condo I area. As on January 12, 2016, according to Palm Beach County planning and zoning, the engineers representing a housing developer have not filed any new questions or applications with the County since receiving the County’s report in September. 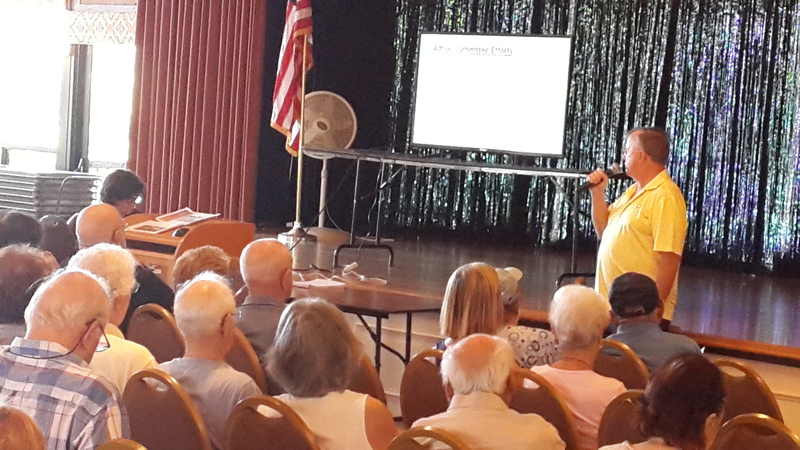 In regards to the development of Villa Del Rey Golf Course into housing, no one has announced any plans. The following actions have taken place since summer 2015. The golf course is was sold in October 2015 for around $5,000,000. The property is “under contract”. This price reflects the cost of land in western Palm Beach County for HOUSING, not golf courses. The owners raised the price from $3,200,000 in 2014. The golf course was legally surveyed in the summer of 2015. In July 15, 2015, the WGI Engineers submitted a “pre-application” set of questions to the Palm Beach County Zoning. At DRO meeting was held on August 12, 2015. Palm County officially responded to the questions on September 23, 2015. Below is more information. In October of 2015, real estate websites reported the golf course “under contract” for sale to someone. In December, 2015, soil samples were bored on the golf course and Via Flora was surveyed. The workers stated “for future housing”. In February, 2016, WGI is actively asking questions of the County and asking to meet to with Condo Boards of Palm Greens. 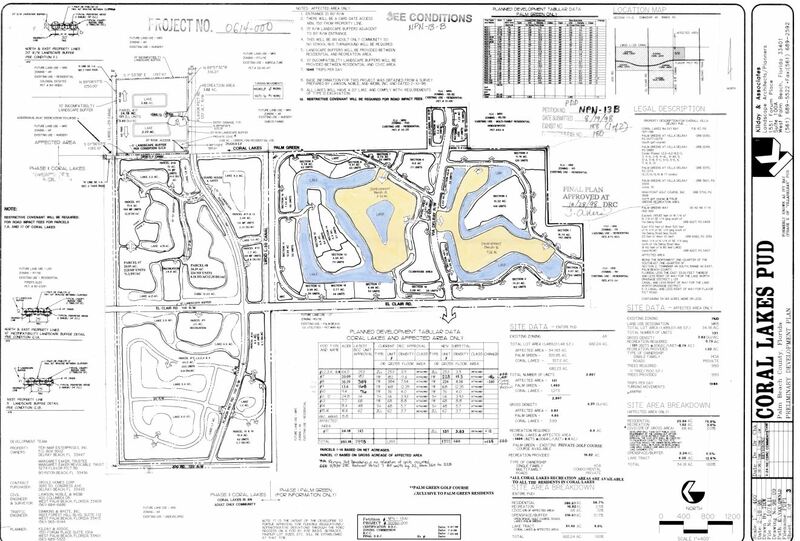 WGI wished to know if the 1998 site plan was valid and more than two thousand additional apartments or condos could be built on the land of Palm Greens, Villa Del Ray Golf and Coral Lakes. For some reason, Coral Lakes and Palm Greens had been grouped into the same “Planned Unit Development” of PUD. Above: Legally adopted Planned Unit Development in 1998. Click to see big version. Below: Plan submitted by WGI Engineers to the County. The yellow areas are proposed housing and the blue areas are lakes. One year ago, Glenn Weiss of Palm Greens investigated the zoning for the construction of apartment or condos on the golf course. Here are his assessments. Mr. Weiss taught planning at FAU and worked as senior planner for Coral Springs. Without the PUD mentioned by WGI above, the golf course is zoned “HR8” or a basic use of 8 housing units to the acre resulting in a possible 944 apartments or condos. With typical bonuses granted by the County, the number of units could easily exceed 1,100. Palm Greens 1 & 2 have different situations for housing. In Palm Greens ONE, Via Flora and Via Delray are public street (Via Aurora is private.) Roads into the golf can easily be constructed from these roads. In Palm Greens TWO, Palm Greens Way is private and therefore roads can NOT be built into the golf course without the permission of the Palm Greens TWO owners. A complicated situation exists regarding the current golf course entrance on Via Delray and whether Via Delray can be used for a housing roadway without the permission of the Palm Greens Recreation Board. In Palm Beach County, many condos and apartments are being constructed at 3 stories high. Because Palm Greens and golf course are zoned for housing, new 3 story buildings could be constructed within 25 feet of property line. (Parking lots within 10 feet) Most of the Palm Green condos facing the golf course are very close to the golf course property line. Therefore, new buildings might rise within 50 feet of back windows. Parking lots might be constructed within 35 feet. A new developer can build single family homes, condominiums or rental apartments. Rental apartments are very profitable today. FINALLY, the legal “Plat” for the golf course states that land of the golf course will be used for golf or recreation “in-perpetuity”. In the last 24 months, the County Commission has revoked the “in-perpetuity” clause and approved housing developments on three golf courses. 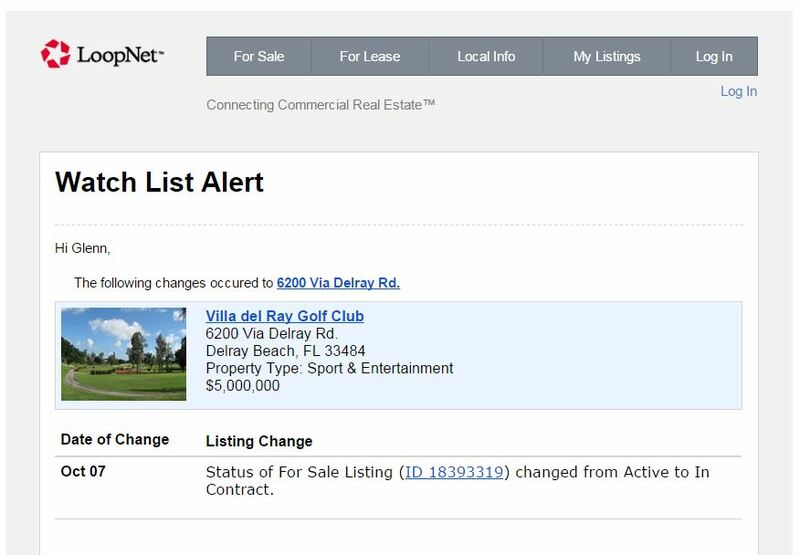 Commercial real website – Loop Net- announced that the golf course is “in-contract” for “housing” price, not golf course price. “In Contract” for real estate deals typically means that Buyer will purchase the property at an agreed price – if the property can get the all the zoning permissions to build housing at the number of homes desired by the Buyer.